WASHINGTON (AP) — John Wall would not be bothered if the Washington Wizards pick a point guard in the first round of the upcoming NBA draft. 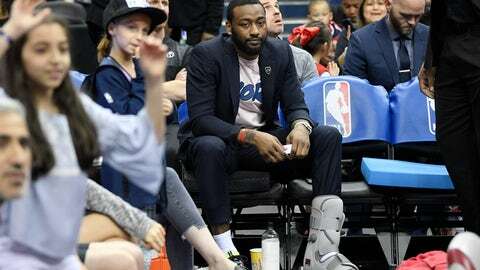 Wall is not entirely sure whether he will be able to play at all next season as he recovers from a torn left Achilles tendon that was operated on in February. Wall appeared in only 32 games this season, averaging 20.7 points and 8.7 assists, before having surgery on his left heel in January. Then he ruptured his tendon in a fall at home, requiring an additional procedure. With Wall and center Dwight Howard missing much of the season, and plenty of on-court problems with defense and other aspects, the Wizards went 32-50, their most losses since 2012-13. A five-time All-Star, Wall has dealt with a series of health issues in recent years, including having surgery on both of his knees. He was wearing a gray walking boot on his left foot and lower leg Tuesday. Wall said he will rehab his Achilles in Miami during the offseason.